ZAMBOANGA CITY, Philippines (AA): A fire broke out Tuesday and destroyed more than 3000 homes in the town of Jolo, the capital of predominantly Muslim Sulu province in the southern Philippines. 5,000 families have lost homes in the fire in in Barangay Bus-bus and Barangay Walled City in Mindanao state. No casualties have been reported. The blaze, which broke out around 3 p.m. (0700 GMT) in the village of Walled City, quickly spread to the adjacent village of Bus-bus and was immediately declared a five-alarm fire. “The conflagration has already razed hundreds of houses because it is a densely populated area,” Sulu provincial government information officer Sonny Abing said as quoted by the state-run Philippine News Agency. 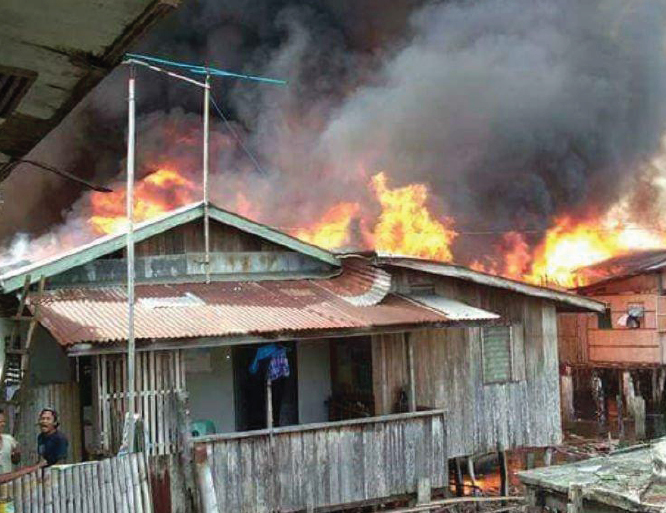 A separate fire broke out at almost the same time in the nearby village of Lambayog. It took more than three hours for firefighters to bring the two fires under control which rendered more than 5,000 families homeless. Abing added that the firefighters had difficulty accessing the slum areas due to the narrow streets. Jolo Mayor Kerkhar Tan said the Fire Bureau has yet to determine the causes of the fires and assess the cost of damage to properties. He said the municipal government has set up at least five evacuation centers for the displaced residents. Four people were reportedly injured and authorities are still checking whether there were casualties. The Provincial Disaster Risk Reduction and Management Office and the Sulu provincial government together with security forces have formed a task group to provide assistance to affected residents.